Well guys, seen as its the beginning of a new year, we thought what better time to reflect on what we learned from 2012. So here it goes! 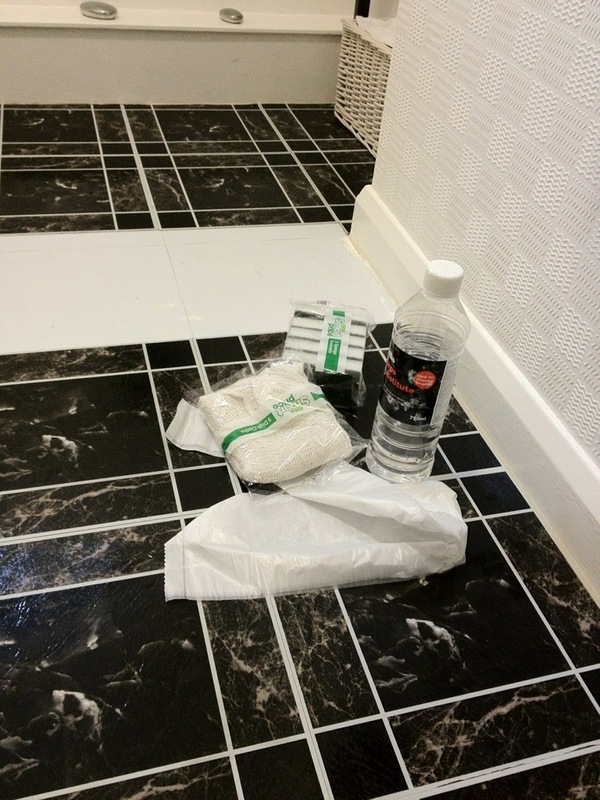 Firstly, we learned that we shouldn’t get our bathroom flooring laid by Franks the Flooring Store. Initially they did a diabolical job, and then sent the same guy out to assess/ rectify his own mistakes. Needless to say, when the guy attempted to fix his own mistakes – it became apparent he was in the wrong industry. Frank’s the Flooring Store soon sharp sent two people to relay our black bathroom flooring. They did a fantastic job. Secondly, we learned not to purchase a headboard via eBay. 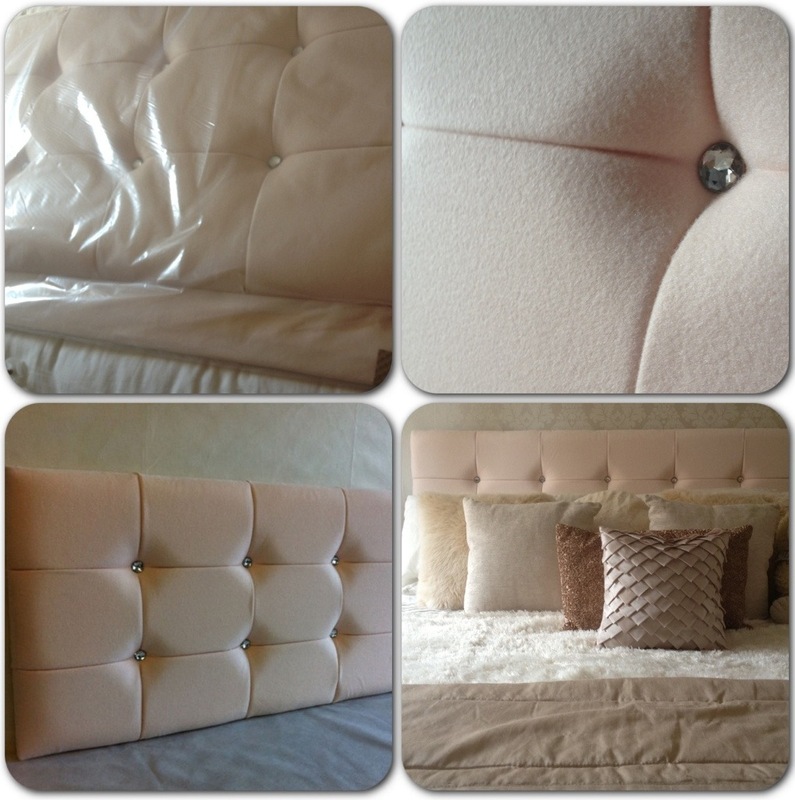 Our experience of purchasing a faux suede headboard via eBay was very disappointing. Not only was the headboard description wrong in regards to the upholstered material which covered it, but also the colour was not as described. On a positive note though, the diamanté crystal detailing to the headboard was very chic. In this instance, we learned that cheaper is not always better! Thirdly, we learned that we love striped wallpaper. Just look how gorgeous our white furniture looks in our teal bedroom. 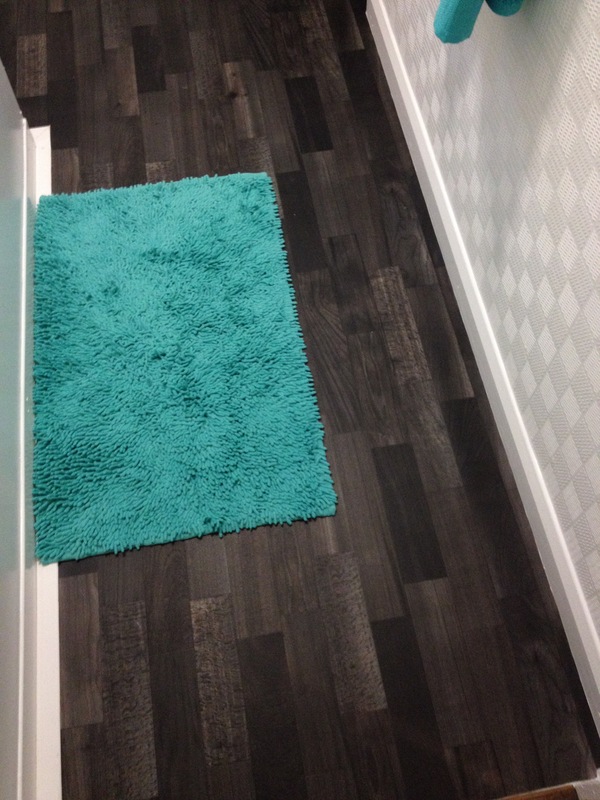 The teal striped wallpaper is awesome! 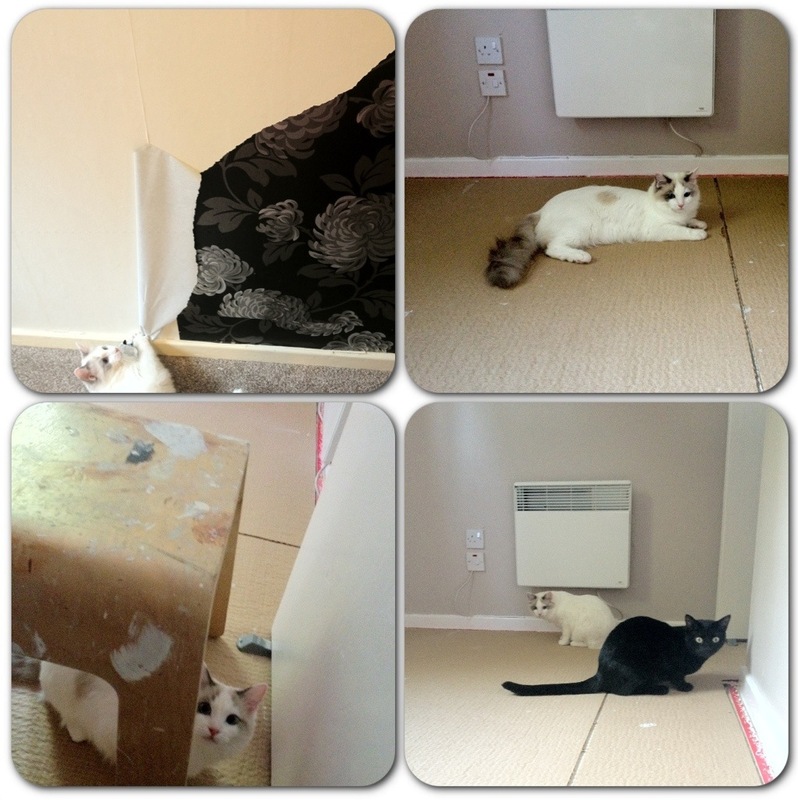 Fourthly, we learned that the cats love to be in on the action, especially when it comes to DIY. Take Angel for instance, she couldn’t resist taking down the wallpaper that time when we redecorated the main bedroom. Diesel is more of the gaffa type, he observes the task in hand. Finally, other than learning why you should NEVER leave kitchen appliances unattended, we learned that Kelly needed a new door mat for indoor use. Frank’s the Flooring Store: bathroom flooring done and dusted! 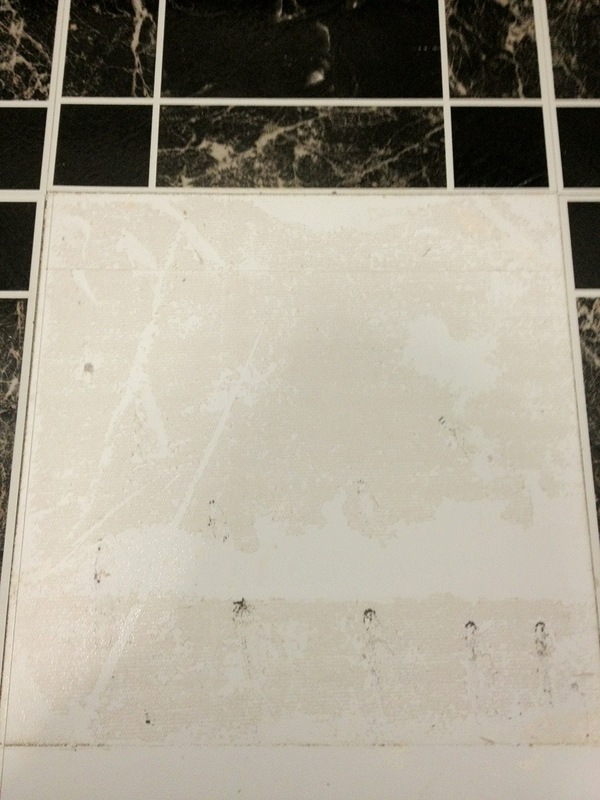 Hey guys, just another quick update regarding our bathroom flooring. It has finally been sorted. Two professional floor fitters, from Frank’s the Flooring Store, arrived and cracked on with the job – doesn’t it look awesome?! I had already removed the messed up flooring, along with all the silicon the first guy had used during an attempt to rectify his own mistakes. We had a good bit of banter with the floor fitters, one of who was the same guy who laid our kitchen vinyl flooring three years ago. 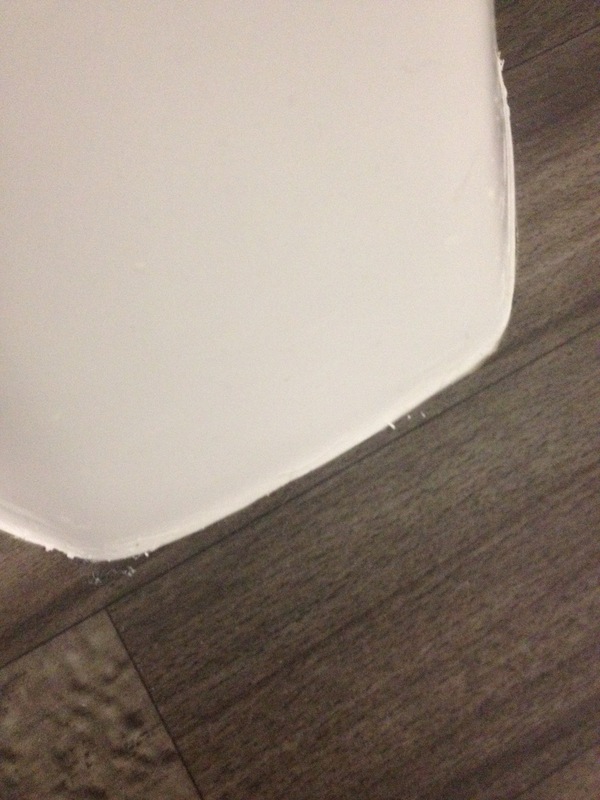 The guys used some kind of special bonding adhesive strips to bond our bathroom flooring (kinda like double sided tape). They stuck the adhesive strips around every edge, and then began laying the brand new vinyl. They did a fantastic job and the straight edges they achieved illustrate just how professional these guys are! After they had left, Kelly and I decided to contact Frank’s the Flooring Store to thank Chris for all his help in resolving the issues we had prior. Well guys just a quick update, basically Frank’s The Flooring Store are now coming out to lay brand new flooring. They have advised me that a different floor fitter will be doing the job and that this will rectify the issues I have with the current flooring. The new flooring is going to be fitted to our bathroom on Friday, just enough time for Kelly and I to take that ‘horrendous’ silicon up, which the previous fitter left in an absolute state, and lift the old (but new) faulty flooring up. 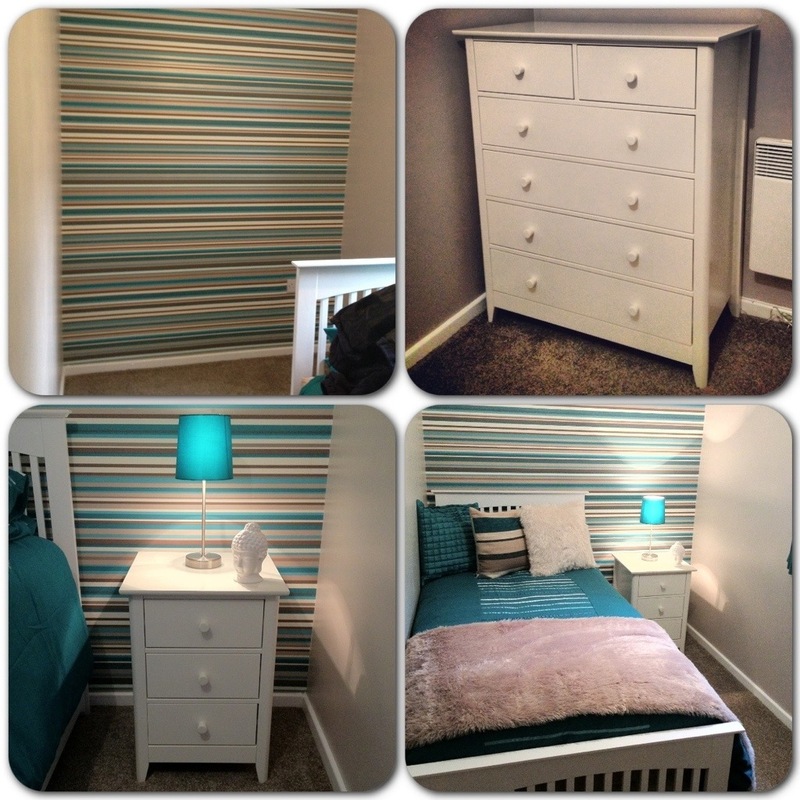 I can not wait to see this room properly finished off! I will keep you guys posted with up-to-date pictures. 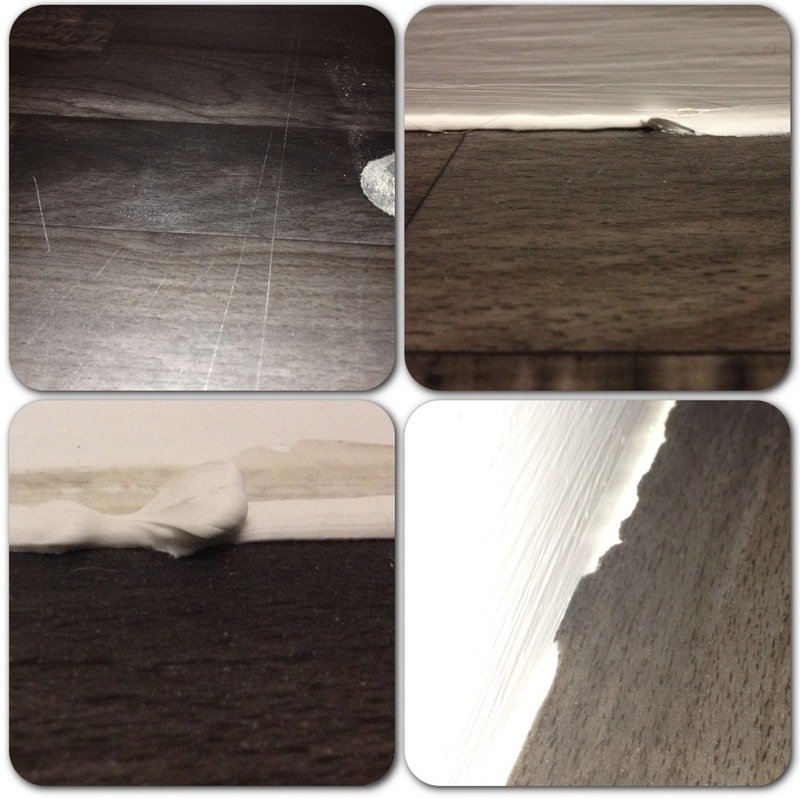 Hopefully such pictures will reflect how good Frank’s the Flooring Store actually are when it comes to laying flooring. I mean, every company has its faults at times, or creates an unhappy customer – but at least now there is actually hope in the problem being sorted once and for all. Frank’s the Flooring Store: customer review part two! Morning guys! How are you all? (feel free to comment on this one). With regards to the Frank’s Factory Flooring, or Franks the Flooring Store – whatever you want to call them, issue well it still has yet to be resolved! After contacting Frank’s the Flooring Store and advising them that I was still awaiting for the floor fitter to call around and assess the situation, I was advised that the floor fitter would be out within 30 mins. Over an hour later he arrived. It was the same guy who messed up the flooring in the first place, so I wasn’t very impressed! Anyways, I thought I’ll see what he’s planning on doing. Next thing, he pulls out a silicone gun and tells me that he’s going to silicone the edges. I thought, “You what? Is that going to cover the scratches too like!?”. 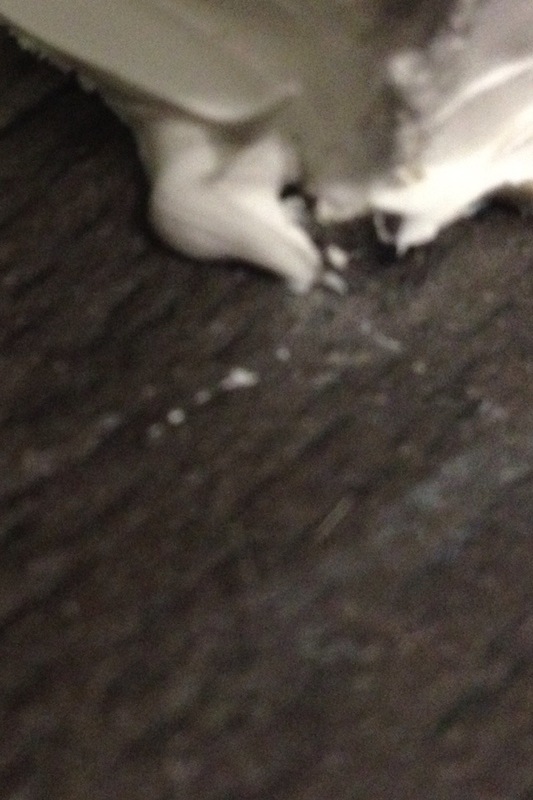 Anyways, I thought I’d watch him silicon around the flooring, with white silicon, seen as he’s the EXPERT. I couldn’t believe my eyes when I witnessed him siliconing the entire room in one continual line of silicon! Correct me if I’m wrong, but when using silicon you ALWAYS slide your index finger over the silicone to leave a flat curved edge, right? Not with Frank’s floor fitters you don’t! 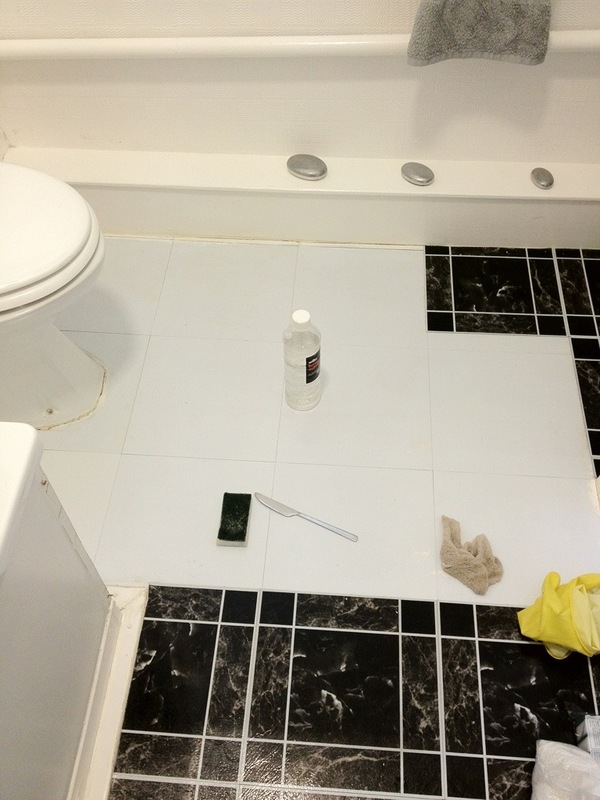 This floor fitter left a continual bead of thick white silicone around the entire bathroom flooring, except for one part of the flooring – I could not believe my eyes! I was extremely shocked and disappointed with the ‘so called rectifying’ of the problem. I on the other hand let everything go over my head and told Kelly that the floor fitter for Frank’s the Flooring Store in Darlington is most certainly in the wrong profession – he should be piping cakes with the way he’s left the silicone! Just look at the state of it! 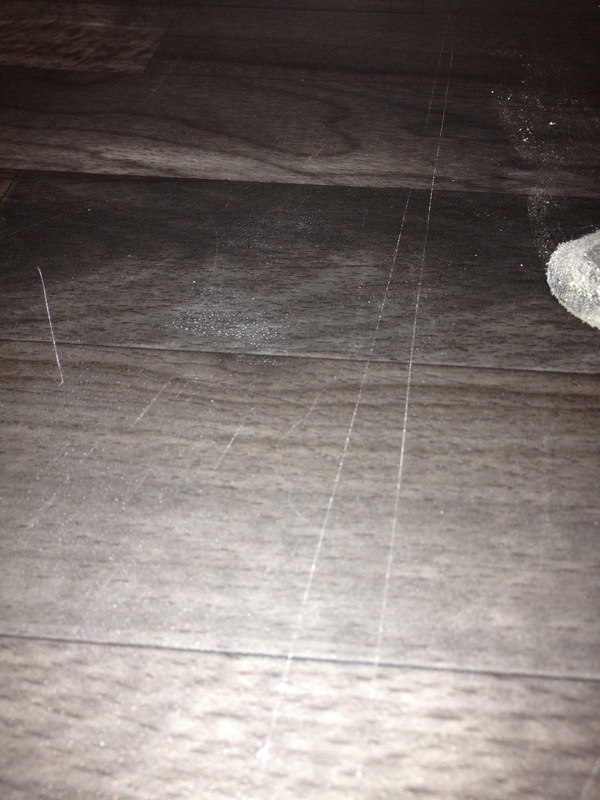 I will personally be taking a trip down to Frank’s The Flooring Store tomorrow to explain that this just simply is not good enough, and to show the manager these photos and ask for their opinion on the matter… As I am an extremely unhappy customer – and so I should be! Frank’s The Flooring Store Review: 0 out of 10 so far! Hey guys, just a bit of an update regarding our bathroom. Where do I start?! Well, the bold bath towels washed extremely well and look fantastic in our newly decorated bathroom. We purchased the flooring from Franks The Flooring Store in Darlington. 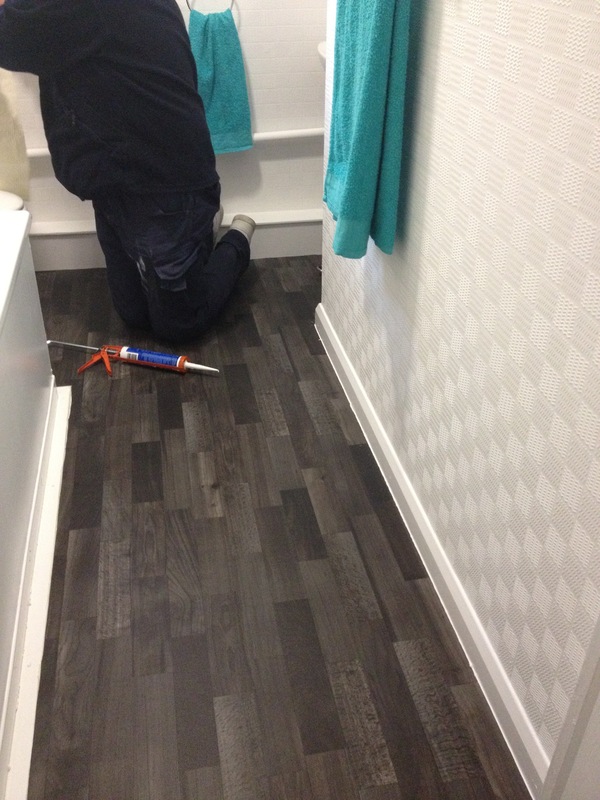 We were told by the staff that the flooring would be fitted by their recommended self employed floor fitters – who fit carpets and vinyl flooring on a daily basis. 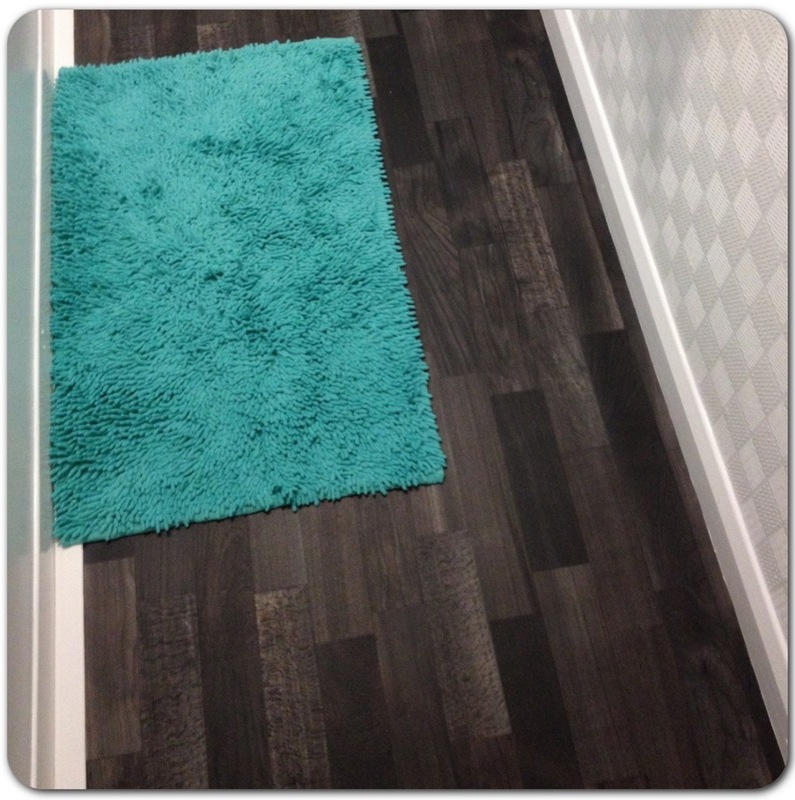 At this, we thought ‘great, the flooring will look perfect!’ We couldn’t wait for our bathroom to be completed, and looked forward to Saturday – the day our flooring was due to be fitted. Saturday came and the floor fitter finally arrived. 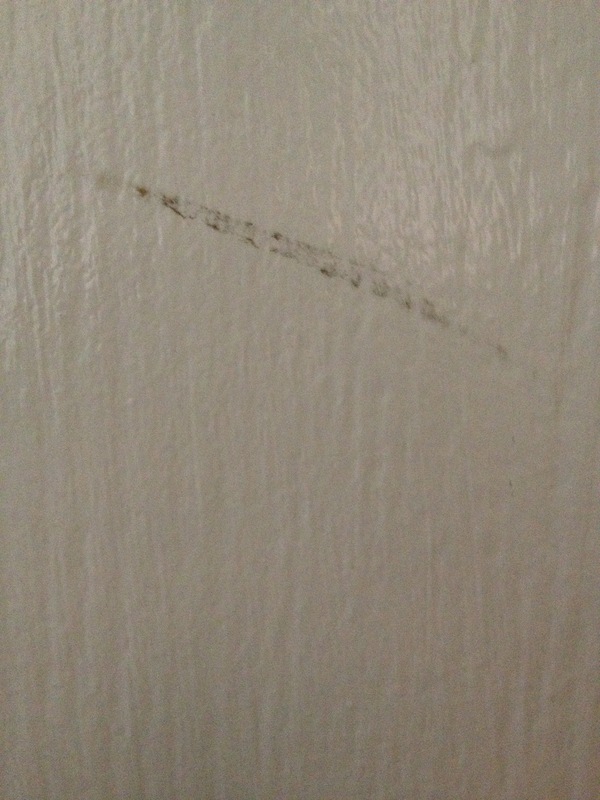 He came in to our home with a young male and wasted no time in un-rolling the flooring – and scratching a huge scratch down our newly glossed bathroom door (see image below) in the process. Kelly and I just sat and observed. At first the guy seemed quite chatty and Kelly and I just left him to get on with the job, without any distractions. Minutes passed until all of a sudden the guy huffed and puffed and stated that the mistake he made whilst cutting the edge of the flooring along the skirting board was due to silicone being there. 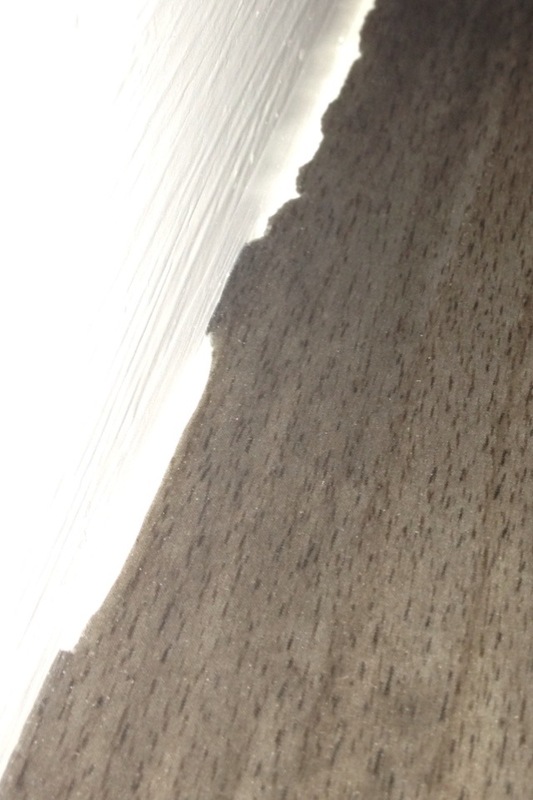 This was nonsense, as who in gods name puts silicone along the bottom of a skirting board?! Exactly!! 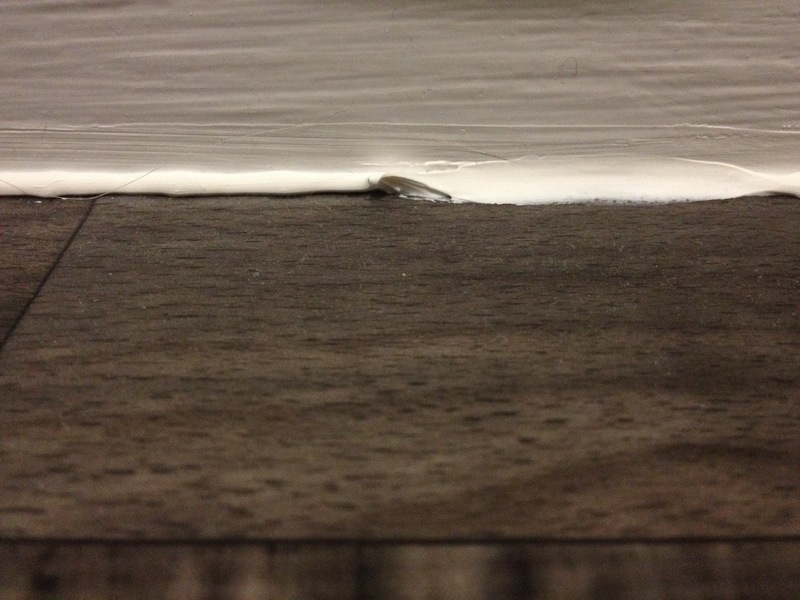 I mean, do you guys see any silicone along our skirting board in the picture below? I thought not. 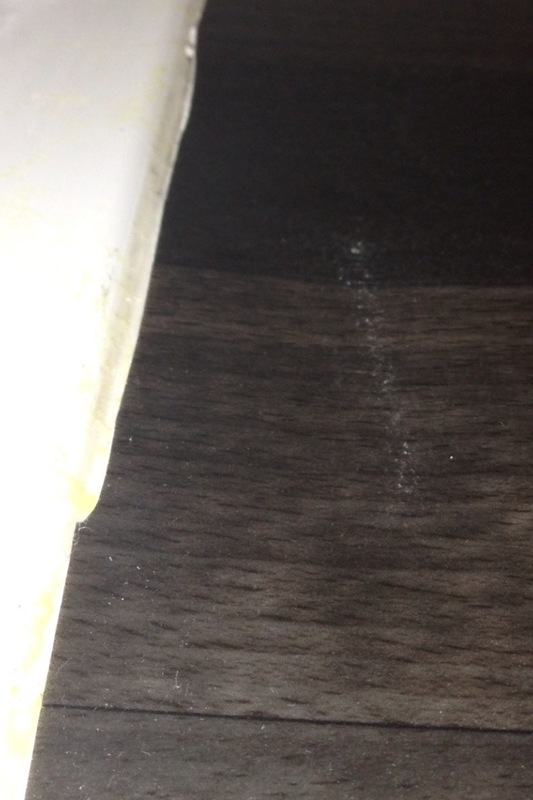 and he complained repeatedly about silicon which wasn’t even there (which is funny because the edging around the toilet, which is siliconed, looks absolutely fine – as shown in the picture below!). He also cut the vinyl along the side of the bath and left it flapping over the raised screw head caps which hold the floor trim on along the outer part of our bath (the plastic caps are raised by at least 2mm!). And also, to top it off, they left the plastic wrapping the flooring came in at the bottom of our communal hallway stairs – luckily no residents slipped or tripped over it, as Kelly and I would not of been held responsible. He finished the job and just left without speaking to us, leaving the young male to collect the floor fitting charge from us. Kelly and I looked at the flooring which over lapped the bath trim plastic, and I said, “What is that!? I am not happy with that over lapping raised screw caps, it looks a complete state!”. The young male replied, “Oh, he wasn’t sure if you wanted it over the plastic or cut around it. I can get him to come back in if you like and sort it?”. I replied, “Your going to have to!”. Whilst the young male went out, I had told Kelly that I planned on ringing Franks The Flooring Store, as there was numerous faults which I was extremely annoyed about. The guy then just left again! I was fuming at the level of appalling customer service we had been given. I asked the young male how much he wanted. The young lad replied £35.00. Kelly paid him the money, to avoid any confrontation. The fitters had left and I contacted Franks The Flooring Store to address my issues with the service and finished result. The guy from Franks was extremely helpful and advised me that somebody would be out to assess the flooring on Monday. Monday came and I had a missed call at 16.35ish (baring in mind the floor fitter was due at 16.45 onwards, and Kelly had arranged to leave work earlier to be home in time). I rang back only to find that the floor fitter was not coming, as his jobs had been cancelled. Apparently the floor fitter will be attending to assess the situation this evening, so I will keep you all posted in the very near future. Shopping: towels and bath mats! With the bathroom flooring already chosen, it was time to shop for some bath mats, towels and flannels. Kelly picked up a red bath mat with matching red towels from Primark. As soon as I finished work I went straight to meet Kelly. We headed to TK Maxx in search of some luxurious bathroom towels and bath mats but unfortunately there wasn’t much selection in the colours we so desperately desired. What use is a bold bath mat without the matching towels right? Anyways, whilst doing our shopping in Asda we browsed the Asda home department only to find an aqua green shabby bath mat with matching bath towel, hand towels and flannels available. 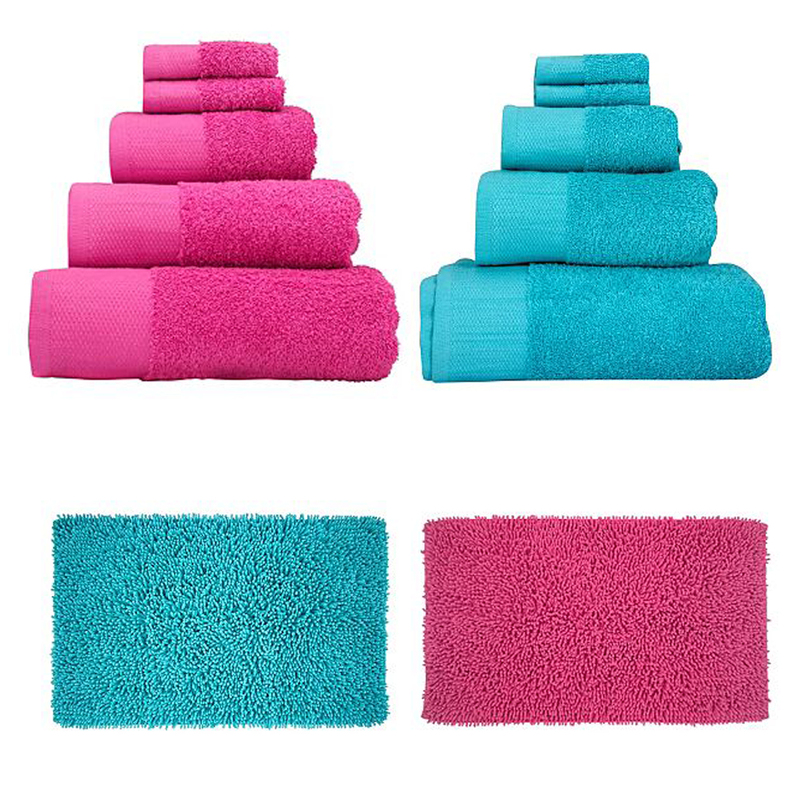 We also picked up a full set of bold pink bathroom towels, again with the matching flannels and a pink shabby bath mat. Totalling just over £50 we thought we did well considering we purchased x4 bath towels, x2 hand towels, x2 medium sized towels, x2 pair of flannels and x2 shabby bath mats! I couldn’t wait to get home and put a set through the wash to see how well they washed – I shall update you guys on the quality of Asda towels once they have dried! Kelly and I were now in the position to shop for flooring for our bathroom. 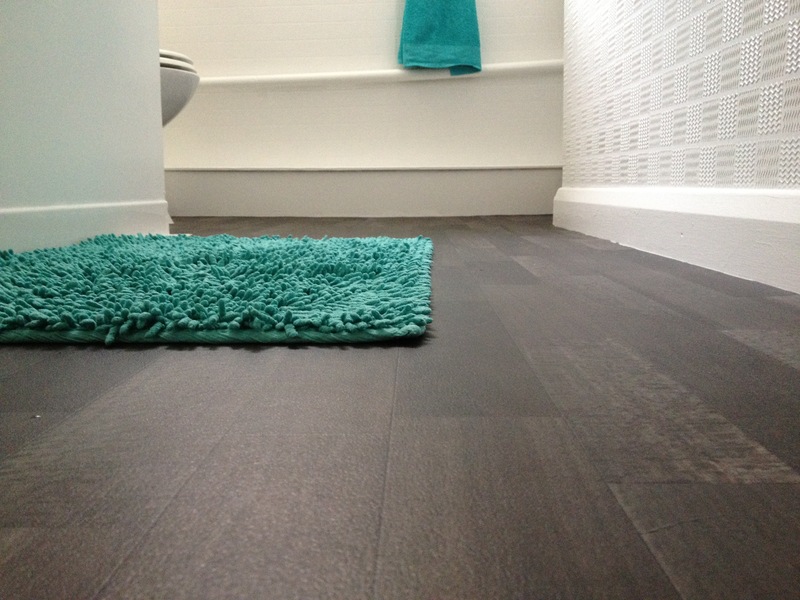 The previous bathroom flooring gave a black tiled effect and this time we wanted something a little different. We decided to go to Frank’s Factory Flooring – as this is where the kitchen flooring was purchased when Kelly first moved in. We measured the bathroom as 8ft long x 6ft wide (which is 2.44 x 2 according to Frank’s). With these measurements we headed in store and browsed the remnants for a cheap alternative. Unfortunately none of the remnants were to our liking. 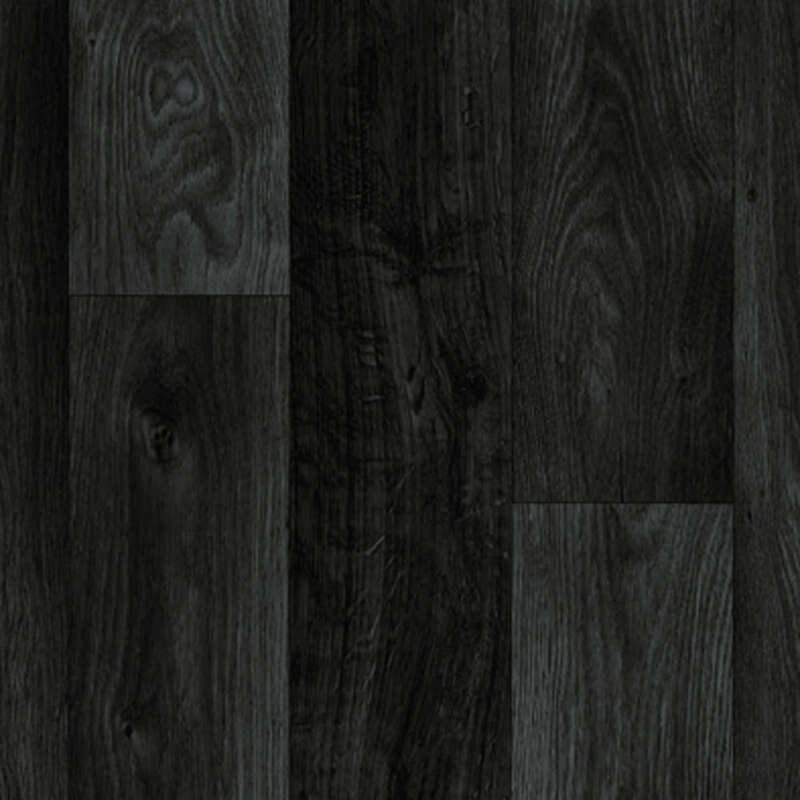 Kelly and I spent a while looking through the sample books until we decided on a desirable black/ charcoal vinyl wooden flooring look (similar to the picture below). It was £50 and £35 to have it fitted. We decided to get the flooring fitted on Saturday, seen as we’re both off work. I can’t wait to see how it looks! Bathroom decorating: done and dusted! So over the weekend Kelly and I managed to decorate our bathroom. Decorating a bathroom can be quite tricky at times due to all the edging, which takes time. I always feel when decorating a room (any room) it’s a good idea to strip the room of everything – if possible! In our bathroom I wasted no time removing all the bathroom fixtures, such as the glass shelf, towel rail, toilet roll holder, and so on. Once all the stainless steel bathroom fittings were removed I removed all the wall plugs and Kelly filled in every hole with Pollyfiller – as we have brand new fixtures. I always like to Decorators Chaulk all edges before we paint any room, as it gives a neat edge and the finish looks far better. With this in mind I went a little OCD with the Decorators Chaulk – oh well! There was one problem area of the bathroom which needed slight attention. The area had a gaping hole where the pipes came out from the wooden ledge we have under the sink. I had no alternative but to pack the hole with paper before filling it with Pollyfiller. Once this was done, it was then time to apply the paint. Seen as we have a narrow bathroom, Kelly took on the roll of painting the walls, as well as edging. I observed and helped where needed – mainly holding the paint tray or passing up the roller! With the walls painted and everywhere glossed it was time to shop for flooring. Hi guys, today is just a quick post to let you all catch a glimpse of what i’ve been up to! 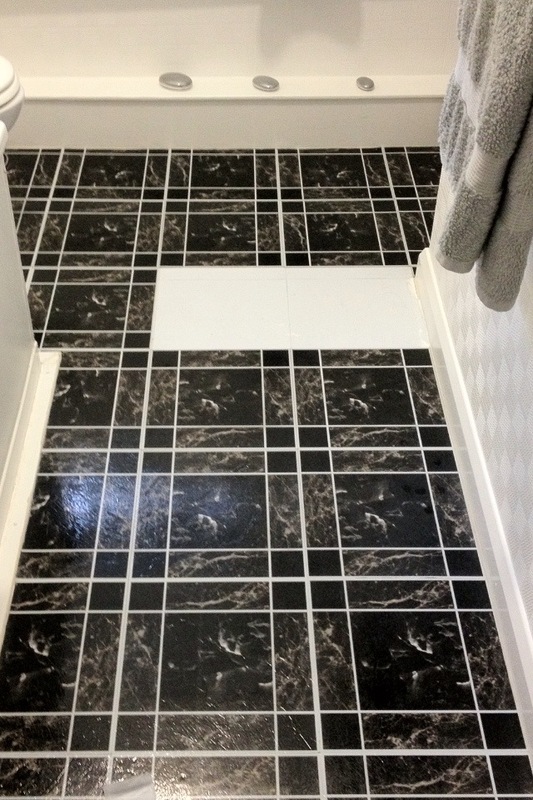 That’s right guys, I have been on my hands and knees taking up those cheap black vinyl self adhesive floor tiles! It has been a demanding task, but luckily for me we had some turps substitute under the kitchen sink. Remember to take care when using substances like turps, they can be leathel (according to the pics on the bottle!). 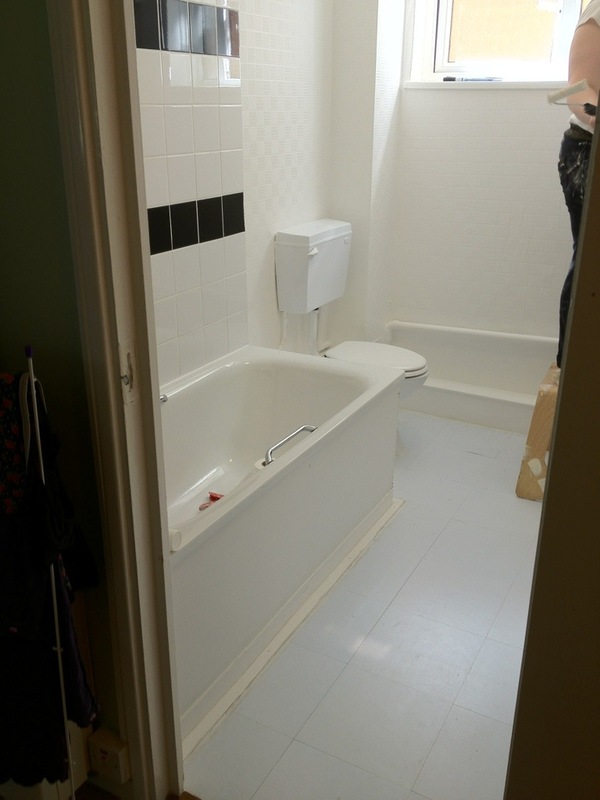 Basically, Kelly and I are planning to redecorate the bathroom – hence me taking up all the floor tiles (Kelly is working overtime, so I’m on my own carrying out the task). This is how far I have got so far – bearing in mind I am using turps and the fumes are crazy (ALWAYS wear a face mask!). The task itself has been quite entertaining. I mean, I have OCD and I like to be fully prepped and checked before I start such a task – unfortunately I could not find a ‘paper scraper’, which would of made life easier with regards to removing the floor tiles. Instead I have been managing with a butter knife – which actually does the job very effectively! 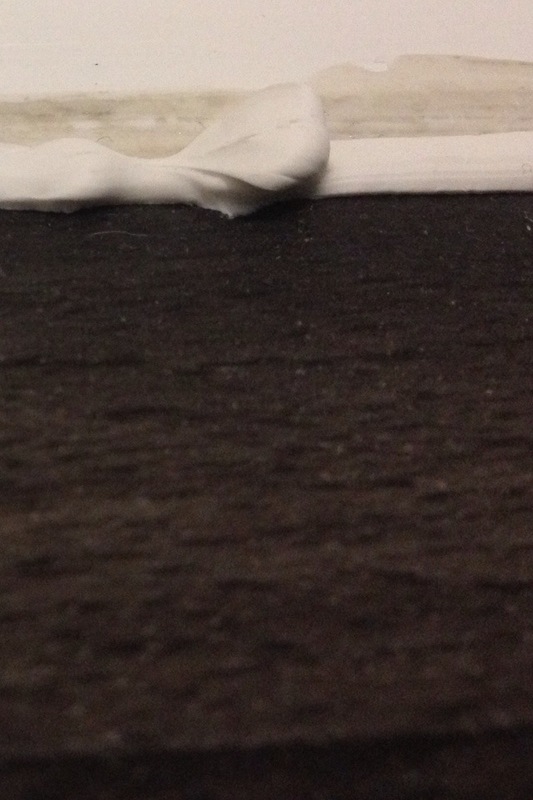 To remove the sticky adhesive from the floor I have been using a small dab of turps and a cloth. Once I have finished a reasonably sized area, I have cleaned off all turps from the floor using boiling hot water and a clean cloth (Please Note: wear marigold gloves when using hot water!). I have then used fresh hot water, and neat Cif cleaner (or Jif, whatever you wanna call it!) and another fresh cloth to make double sure that all turps and adhesive is removed. It’s a long ended task but I’d rather the job be done properly, than be left with sticky horrid adhesive all over our floor – like the picture below!